Arch top oval octagon and circular windows curtain rod kit to 46"
hardware, clear rodding and instructions for creating arch, oval, eyebrow and circular treatments. Crystal clear rodding easily bends to the desired shape of windows. Rod is easy to cut to length with a hacksaw. You can splice rods together for an even bigger window. Rod snaps into clear clips installed in frame for a secure fit. by Graber. Extra hardware is available. Full pack price on 6 each. Curved drapery rods for windows with curve. This is a real arched curtain rod for arched windows. Arched drapery rods for special windows. Clear curtain rods. Single lock-seam standard curtain rods 28-48" projects 1 1/2"
Projection, 1 1/2 inches from mounting surface. Graber lock-seam curtain rods are made of .013 gauge steel and measure 3/4 x 3/8 inches for extra strength. They are coated inside and out, leaving no exposed edges. For medium to heavy curtain fabrics. 4-213-1: Single lock-seam standard curtain rods 48-84" projects 1 1/2"
Metropolitan modern curtain rod finial. Use with tab top curtains, eyelet curtains or pinch pleat draperies. 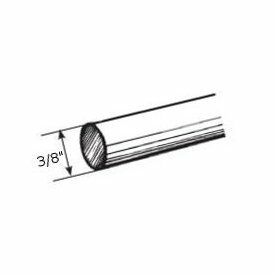 2 3/8" D x 4" P.
Single corner curtain rods 28"-48"
Made of vinyl coated fiberglass yarns. 5 percent openness factor makes this roman shade fabric perfect for windows that require more privacy. Comes in 63, 84, 98 inch wide fabric. Available in cut yardage or 30 yard bolts. 4 foot twisted wood curtain rod 2 1/4 inch diameter. Decorative curtain rods for any window. Renaissance Collection by Design Elements. 1 3/8 inch Lacey finial for 1 3/8 inch wood pole. By Kirsch. Zinc plated for Kirsch Architrac systems. Baton draw, ceiling or wall mount. For pinch pleat or Ripplefold systems using the 94003, 94004 and 94008 curtain rod. One way right, includes 4 support brackets. Empire curtain rod hardware for the budget minded. Empire Traverse Rods are made from heavy guage steel with a baked enamel finish. Quick mounting drop in brackets and supports that fit over rod are included. Cord guide is included to hold cord to wall. The Empire rod has self lubricating pulleys and slides.Polyester cor and continuous lacing for use at either end or to convert to one way draw. Curtain hardware for the budget minded. Empire curtain (traverse) rods support for outside mount curtain rod..
3505-025: Double curtain rod hardware support for empire curtain rod return 5 1/26 1/2"
Convert 4 1/2" dauphine curtain rods to use in bay windows or as corner curtain rod. by Graber (for 4 1/2" wide Daulphine rod) White finish. 100 minimum Steel baton, white. For grommeted cubicle curtains or hand draw, pinch pleated draperies. With harness snaps. 4 1/2" wide. Clearance 4 1/2 to 5 1/4 or 7 1/2". A Kirsch curtain rod. Bulk price 10 each. Superfine traverse rods. Rod only Drop In Brackets. Push In. One Way draw drapery rods, cords left. Superfine Traverse Rods Bulk Pack includes rod only.Brackets, supports and cord pulley must be ordered separately. Made from heavy guage steel with a baked enamel finish. Exclusive Kirlon on all sliding surfaces. Push in brackets and extension plates are available as an option. Only the finest pulley sets are used. Strong and durable with a slide gate for easy removal of extra slides. Long wearing, stretch resistant polyester cord and continuous lacing for use at either end or to convert to a one way draw. One way draw, extends from 30 to 48 inches. Wall mount bracket for the 1 3/16" Gifer Contemporary curtain rod in front and a 3/4" curtain rod in back. Hospital curtain track by Kirsch. Used for hospital cubicles and windows and also residential applications. Can be curved for bow window curtain rods. Order in 12 foot increments only . For grommeted curtains and hand drawn draperies. White finish master slide for 9003 curtain rod and 9095 rod. Heavy duty and double duty rods. Two way draw, straight and curved. 9492-025: Master carrier one way draw reversible.